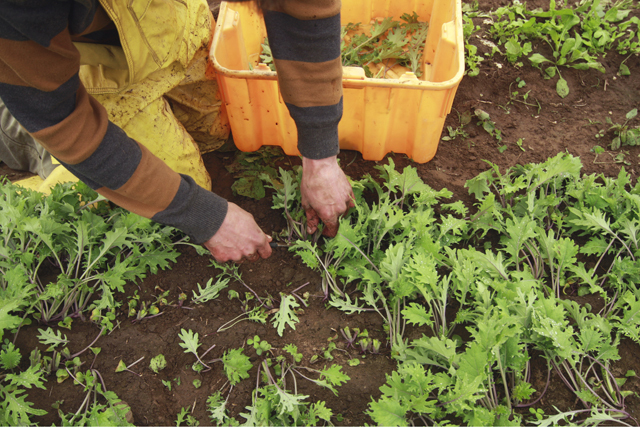 Gardeners are well-suited to help fight climate change, but sustainable gardening requires putting aside some traditional practices that work against nature. Fortunately, there are plenty of ways to create a beautiful, natural, and functional landscapes that benefit the environment and our senses. Gardening sustainably also reduces the cost and labor required. 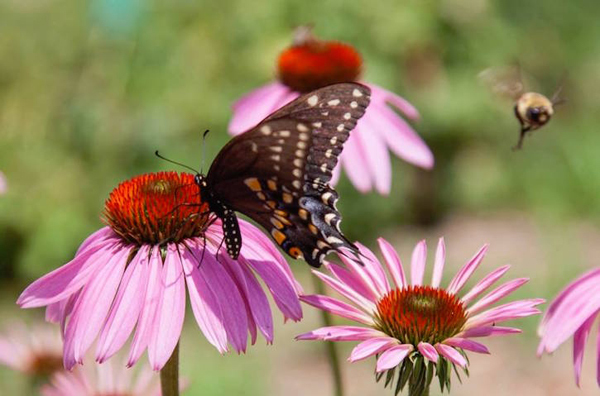 Purple Coneflower is a great climate-friendly addition to your garden. Over the country, our lawns add up to about 31 million acres, an area slightly larger than Mississippi. The cost of all that manicured grass is huge. According to the NRDC, Americans consume 3 trillion gallons just to water our residential lawns (about half the volume of Lake Champlain), 200 million gallons of gas to power our lawn equipment, and 70 million pounds of pesticides every year. On top of the ecological burden, lawns deprive birds and other wildlife of useful habitat and food, creating areas with little environmental value. Instead of keeping large, open lawns, turn your yard into miniature sanctuaries for birds and pollinators. For species feeling other stresses from climate change or loss of habitat, having a backyard stop to rest and refuel can support them when they need it most. 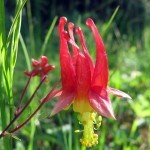 Choose native plants whenever possible. 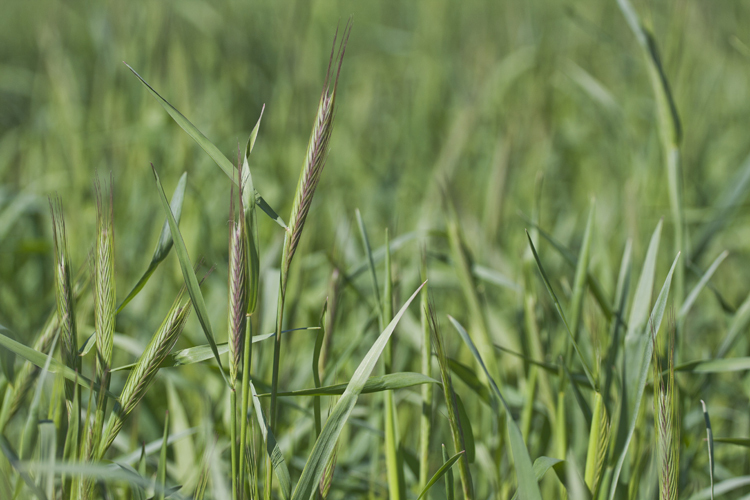 They help grow far more insects and provide better resources for birds and pollinators. 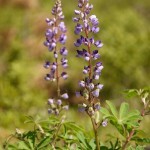 Since native plants are adapted to a New England climate, they’ll also require less protection and effort to maintain. In Massachusetts, butterfly bushes and purple coneflowers are a couple excellent choices among many. Find some great native options. Producing and transporting fertilizers that include urea and ammonium nitrate, which are common in inexpensive home lawn care fertilizers, requires a lot of energy. Four to six pounds of carbon are emitted for every pound produced, so even modest use increases a garden’s carbon footprint. Overusing fertilizers (a common mistake) releases nitrous oxide, which has 300 hundred times the warming potential of carbon dioxide and makes a garden’s carbon footprint excessive. With stronger, more frequent storms, we’re also seeing more nitrogen-loaded runoff in waterways. The buildup contributes to harmful algae blooms and toxic dead zones. Avoiding the use of such fertilizers helps offset the impact of stronger storms due to climate change. Replace nitrogen fertilizers with manure or locally-produced compost sparingly and strategically. Trees or other woody plants help remove carbon dioxide from the atmosphere, so plant as much of your property with trees and rigid shrubs as possible. Placing trees, shrubs, and vines to block winter winds and create summer shade can reduce the amount of energy required to heat and cool your home. Red Oaks, Red Maples, and Dogwoods are good native choices that should remain resilient to changing climate conditions over the next few decades. Gardens filled with native plants will generally thrive with normal amounts of rainwater, saving the time, energy, and water of irrigation. When you need more than what the weather is providing, or at different times, collect and store water with rain barrels, or sculpt your land to drain to areas where you want the water to go slowly and effectively, using what you receive as efficiently as possible. Growing fruits and vegetables at home reduces your carbon footprint. It’s the ideal way to “eat local.” It eliminates the fuel needed to transport, store, and process food elsewhere. Grow plants from seed and make your food garden as diverse as possible, while mixing perennials with annuals. Berries are a great perennial option, as is rhubarb. Asparagus, grown commercially actually has a high carbon footprint, so growing your own can be a big help. Kale and garlic are good to grow as annuals. Reduce usage of gas-powered equipment like mowers, weed whackers, and leaf blowers as much as possible. Your neighbors will love you for it and you’ll be keeping carbon out of the air. When you can, use manual equipment: rakes, reel mowers, and shears. When necessary, use electrical equipment. This entry was posted in Climate, Gardening on August 2, 2018 by Daniel Brown. Posted on March 28, 2016 by Hillary T.
One major way to help pollinators thrive—and beautify an outdoor space—is to plant a native pollinator garden. 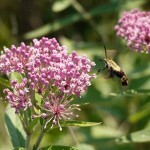 Here are six native plants to grow for pollinators. During spring and summer, several of our wildlife sanctuaries offer native plant sales. Stop by to learn more and pick up varieties for your own backyard. Habitat Education Center’s Herb Sale in Belmont includes native wildflowers as well as vegetables and herbs. 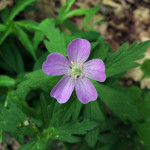 Moose Hill’s two-day Native Plant Sale in Sharon offers a variety of native perennials, ferns, and ground cover. 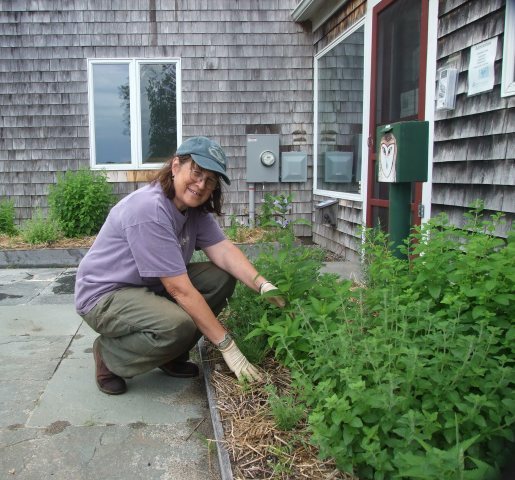 The Native Plant Sale & Open House at North River in Marshfield features native shrubs and flowering perennials as well as family activities and snacks. Pick up plants to attract butterflies at the annual Audubon Nature Festival at Ipswich River in Topsfield. Pick up plants to attract butterflies during Broad Meadow Brook’s Annual Butterfly Festival. This entry was posted in Gardening on March 28, 2016 by Hillary T..
On quick glance, it may seem that your garden beds are thriving: the plants are lush, green, and plentiful. But take a closer look and you may discover that your yard has been overtaken with non-native invasive species. Invasive plants are one of the greatest threats to the nature of Massachusetts because they out-compete, displace, or kill native species. These non-native species thrive and proliferate here. While many were introduced innocently years ago, it’s our job to help eradicate them. The first step: knowing what to look for. 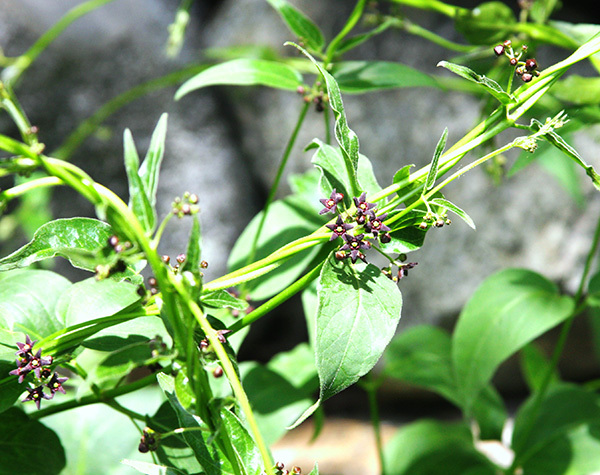 Here are four common backyard invasives..
A perennial twining vine, black swallow-wort has opposite, deep-green, glossy leaves and small deep mahogany flowers. It’s an aggressive grower, spreading by seed. Not only is it a threat to native plants, black swallow-wort also causes trouble for the monarch butterfly. 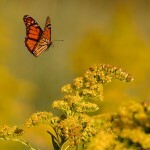 Monarchs can only safely lay eggs on milkweed. Black swallow-wort is in the same family, but is toxic to monarchs. If a monarch lays her egg on a black swallow-wort leaf, the forthcoming caterpillar will die. Brought over by the settlers in the 1800s, this aggressive biennial is taking over yards and forest floors. 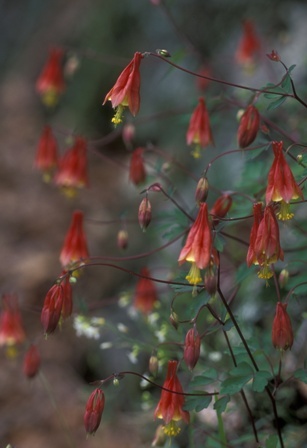 Its most distinct features are its green heart-shaped leaves with deep veins and tiny four-petaled white flowers. Note that the flowers don’t appear during the plant’s first year. You can also employ the smell test: when crushed it gives off a garlicky smell. The dainty white flower can produce thousands of seeds that cover large areas in just one season. Even after you remove the plant from your yard, its seeds can hang out in the soil for five years or more. Also aiding the spread of this aggressive and sticky species: cars, stormwater runoff, and even people’s sneakers! And, like black swallow-wort, it can be toxic to some insects. Some types of butterfly eggs laid on its leaves will fail to hatch. This small thorny shrub is most identifiable by downward-facing clusters of yellow flowers that turn into red oval-shaped berries by late July. Birds eat the berries and distribute the seeds throughout the woodlands. 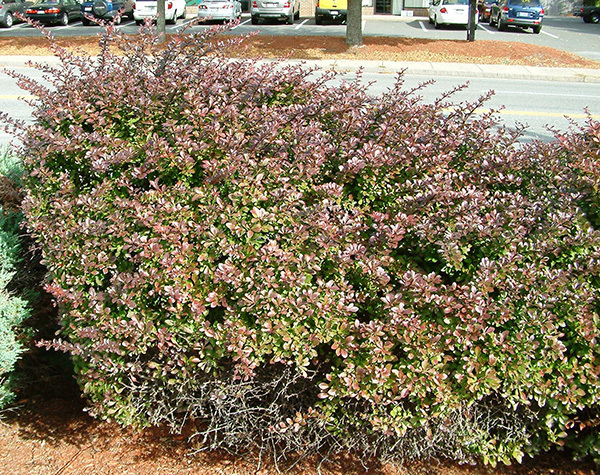 An aggressive grower, Japanese barberry outperforms native plants, taking over areas. 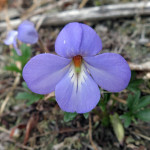 There are both purple leaf (as shown) and green leaf cultivars. 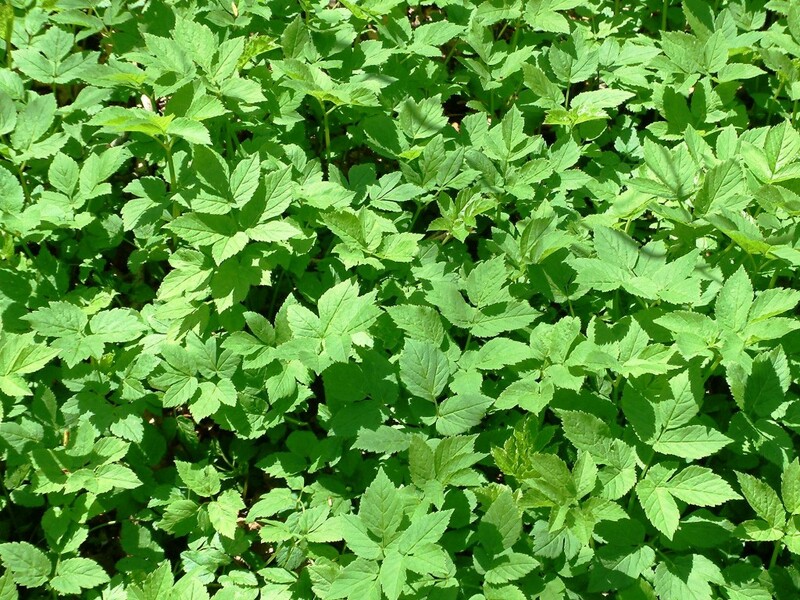 Bishop’s weed, also known as Goutweed, is a creeping perennial in the carrot family. It was once used as a ground cover. The leaves are sometimes variegated, green and white, sometimes solid green, and they have many lobes or parts. The flowers are white and lacy like Queen Ann’s Lace, parsley, or carrots when they go to seed. The first line of action is to stop them from going to seed. If they have already flowered, cut the flowers off. If you can, pull them up or dig them up. Never put the flowers or plants in the compost. Instead, bag up the offending invasive plants and place them in the trash. 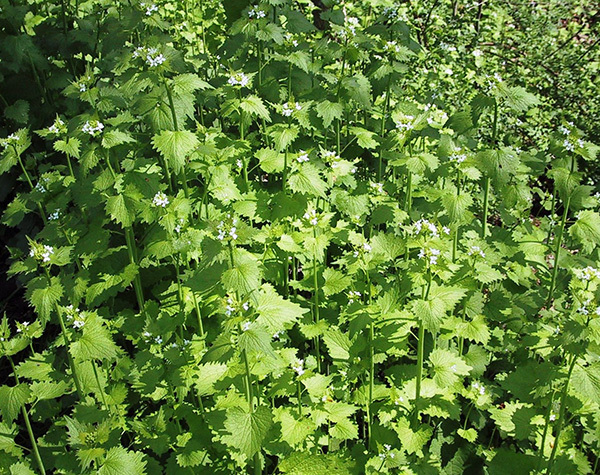 Learn more about these invasives and more in our Online Invasive Plant Guide. This entry was posted in Gardening on August 13, 2014 by Mass Audubon. 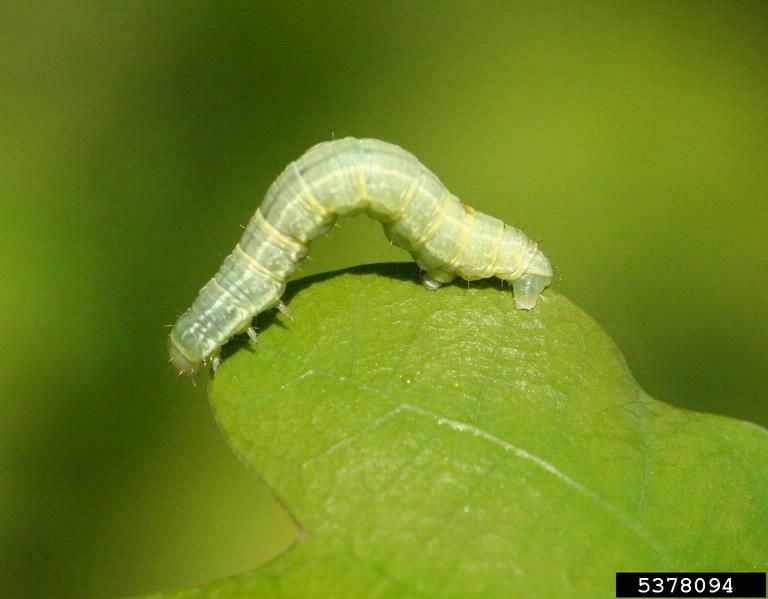 Remember the little pale green caterpillar that ate through your trees and roses last year? Well, it’s back! The caterpillar stage of the invasive winter moth (Operophtera brumato) eats young, tender leaves, sometimes before the leaves even get a chance to emerge from the bud. The winter moth caterpillar is just one of hundreds of species of tiny green caterpillars, or inchworms, found in North America. Most are native and ecologically helpful, even though some, like the winter moth, can be a nuisance. It’s easy to tell winter moths apart from beneficial inchworms. The best way is by looking at the back end of an inchworm: If it has only two pairs of legs on its back end, it’s probably a winter moth. More than two pairs of legs on its back end means it’s probably a “good inchworm” and should be let be. Winter moths are also stouter than other inchworms, and have a white stripe along the side. Last November and December you might have seen hundreds of moths on cool winter evenings flying around outdoor lights. They were the male moths. They were out looking for vertical surfaces, like tree trunks, to find the virtually wingless females and mate. Once the moths had mated, the females lay their eggs in the craggy bark of the trees. Through the winter months, the tiny eggs lay waiting for the perfect time to emerge. Early spring, when the temperature and day length are just right, the buds of trees start to open. This is also when the tiny pale green inch-worm-like caterpillars of the winter moth emerge. They then eat their way through the leaves while they are still in the emerging bud. The leaves emerge skeletonized with only their veins remaining or if the leaves had a chance to develop the leaves are peppered with holes. Most trees can handle a year of this leaf eating if there are not other forms of stress such as drought, insect infestation, or too much sun or shade depending on the tree. Often, they can send out a second flush of leaves. Remember trees and all plants need to have leaves; it is where the process of photosynthesis occurs (ie where the plants make their food). Most people ask what they can do about these leaf-eating caterpillars. Sure there are sprays that can eradicate them. But, keep in mind they are not selective. The spray that kills the caterpillar stage of the winter moth also kills all of the butterflies in their caterpillar stage. Paper or plastic strips covered with a sticky substance are commercially available to create a barrier that entraps the adult females and caterpillars. Though logical, this method has not proven to be effective for major infestations. One option is to not plant trees that are extremely affected by the winter moth. Instead of vulnerable trees like crabapples, pears, and weeping cherries, try planting native trees. After they are established, (generally a year), they will be more resistant to forms of stress and better able to withstand the damage done by the winter moth caterpillar. Learn more about what you can do to control winter moths on our website. This entry was posted in Gardening, Nature Notes and tagged spring on April 28, 2014 by Mass Audubon. Posted on June 18, 2013 by Hillary T.
If you have ever been to Felix Neck Wildlife Sanctuary on Martha’s Vineyard during the summer, there’s a good chance you had an encounter with a mosquito, or 1,000. Turns out, these pesky insects love the wildlife sanctuary just as much as we do. It’s one thing to have them on the trails, but each season they take over the Nature Center, where we host programs for kids and adults of all ages. The mosquitoes lurk in the tall grass that surrounds the front of the center, just waiting for the door to open so they can make their grand entrance. Scientifically, we know that mosquitoes are attracted to the carbon dioxide we breathe out. So unless we stop exhaling, mosquitoes will keep on coming. We also know that, in an effort to create a more “natural” mosquito repellent, many manufacturers have turned to nature’s bounty for scents that have been suggested to ward of these little buggers. The season has just begun, but we have already noticed a decrease in the number of mosquitoes indoors. Is it because of the garden? Or was removing the grass enough to do the trick? There’s still much to learn and observe before we can deem the experiment a success. Regardless of whether or not it really repels mosquitoes, we now have a lovely, scented garden that visitor can see, smell, and touch. Seems like a win-win situation to us! This entry was posted in Gardening on June 18, 2013 by Hillary T..
Spring has sprung, which means vegetable gardening season is right around the corner. Can’t wait to get started? Instead of buying seedlings, start your plants from seed indoors. Now’s the time to dig in. Cost. For a couple of dollars, you will have enough seeds to fill multiple gardens. Don’t need them all? Set up a seed exchange with friends and neighbors. Taste. Nothing beats the flavor of home grown, sun-ripened tomatoes, from Cherokee Purple to Green Zebra to Brandywine. To grow your own seedlings, you will need a few simple things. A sunny window. One that faces south or west should provide a good light source. Pots with drainage holes. These don’t need to be fancy; clean yogurt cups with holes punched in the bottom will work. Something to place under the pots to allow you to water the soil from the bottom up. Seed starter mix. This mixture is lighter and fluffier that potting soil to make it easier for new roots to develop. You can find it at any garden center. Seeds. Be sure to read the package instructions to determine how to plant the seeds, what kind of light they require, and how much water is necessary. 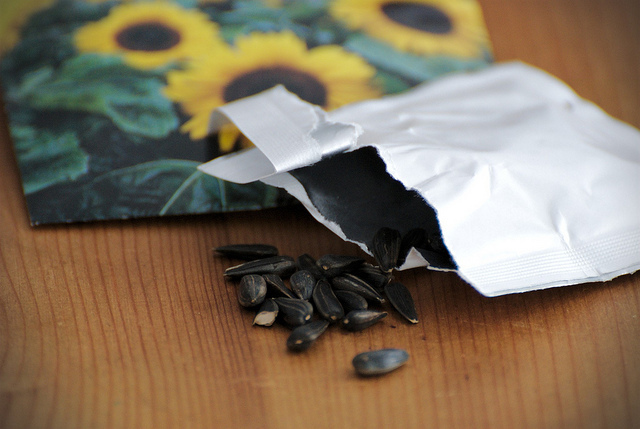 Within a few days, depending on the temperature, your seeds should be up and growing. 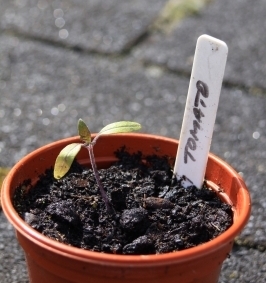 Once germinated, make sure you keep the seedlings slightly moist, but not wet. Remember: Roots need water but also air. All seedlings need to be “hardened off.” Bright sunlight and cool winds can damage young tender plants. To toughen up your plants, put them outside in a shady place during the day and take them in at night. If the plants turn red or or silver they’ve gotten too much sun. Some plants such as peas, pansies, lettuce, and spinach can take the colder temperatures and once hardened off can be placed out in the garden while it’s still cool outside. Tomatoes, cucumbers, peppers, basil, and many flowers need nighttime temperatures above 55 degrees. To insure your plants will flourish, wait until it’s above 55 degrees for 5 nights in a row. Have you started seedlings yet? Tell us what you’re growing and how it’s going in the comments! This entry was posted in Gardening on May 1, 2013 by . Here’s a thought to warm up to: garden season is a few short months away. And if gardening is one of your goals for 2013, now is the perfect month to start planning. Vegetable. Nothing tastes fresher than spring peas right off the vine or a sun-warmed June strawberry. Wildlife. Native plants, which make less demands on the water supply, provide food and habitat for birds and other wildlife. Butterfly. By planting the right host and nectar plants you’ll get the chance to see the miraculous life cycle of these beautiful insects. How much sun will the garden receive? If you’re going to grow vegetables or herbs, they generally need full sun. Full sun is considered to be six or more hours of direct light. Do you have enough space? Trees and shrubs will grow and what is small in a pot today can grow, depending on the plant, larger than your house. Be aware of septic systems and electrical lines when siting gardens or plantings. Where is the best place to plant? Don’t be afraid to think outside the fence. If you have more sun in your front yard, grow the vegetables there. I have seen some beautiful, very appealing front yard vegetable gardens. Some people like to draw out the garden on paper, others prefer to list the plants on their computer. Whatever you plan out, cut it in half. While those five varieties of heirloom tomatoes would be lovely, do you really have the time, space, and the energy to water and weed all of those plants this summer time and preserve all those extra fruits in the early fall? Remember: a garden can always be expanded to fit in one more raised bed or another section of perennials, but it’s a lot more difficult to scale back mid-season. This entry was posted in Gardening on January 22, 2013 by .